To cater to the needs and requirements of Indian market, Wishtel has released its IRA series of low cost tablets in India. The tablets are priced in range of Rs 4,000 to Rs, 5,500. 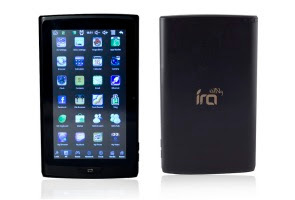 Named as IRA, the tablet has been launched in two models--- one operable with Android 2.2 Froyo and the other one is provided with feasibility for Linux Sugar. The Linux version of the tablet has support for Indic languages. The tablets feature 7-inch capacitive display, a 800MHz processor made by Via, 512MB RAM have a full USB port, a mini USB port and have support for external memory cards. The tablets also support USB modems, and have built-in Wi-Fi 802.11 b/g capabilities. In battery, tablets have 2800 mAh battery with approximate of five hours of battery life on Wi-Fi and 3G modes. On video mode, the battery exhaust in three hours. In apps, they have an Internet browser, Media player, photo viewer, office document editor, Skype and iRead. The Wishtel has arrived as tough competition for DataWinds Aakash 2. The two variants, the IRA and the IRA Thing come for the price of Rs 4,000 and Rs 5,500 respectively.